27 October 2016 – Microsoft today announced the launch of its latest Windows Server 2016 and System Center 2016. Enterprises and businesses can now broadly acquire the server operating system that accelerates innovation and security of both traditional and cloud-native applications. As a cloud-ready OS, Windows Server 2016 inherently enables hybrid cloud. Backed by 20 years of innovation, the Windows Server 2016 offers seamless portability across datacenter, private and public cloud environments via virtual machine and new container formats that can be reliably deployed wherever the business requires. Advanced Multi-layer Security: Security attacks have become more sophisticated in an increasingly connected world. Organizations must respond with a more sophisticated environment that presents new layers of defense at every level of potential compromise. Windows Server 2016 gives IT the power to help prevent attacks and detect suspicious activity with new features to control privileged access, protect virtual machines and harden the platform against emerging threats. Software-defined Datacenter: Windows Server 2016 delivers a more flexible and cost-efficient operating system for any datacenter, using software-defined compute, storage and network features inspired by Microsoft Azure. Cloud-ready Application Platform: Applications are at the heart of every organization and its ability to serve customers and compete effectively for their loyalty. As the digital transformation accelerates in every organization, nearly every application needs to transition or transform. Windows Server 2016 delivers new ways to deploy and run both existing and cloud-native applications – whether on-premises or in Microsoft Azure – using new capabilities such as Windows Server Containers and the lightweight Nano Server deployment option. Enterprises can get started now by trying out the System Center 2016 evaluation, and tune in to the on-demand Windows Server 2016 webcast. The latest version of System Center makes it easy for organizations to deploy, configure and manage virtualized, software-defined datacenter and hybrid cloud infrastructure. It offers an array of new capabilities that amplify the ability to meet the most demanding business requirements, providing support for everything from provisioning the physical and virtual infrastructure to IT process and service management. Greater heterogeneity and cloud management with broader support for LAMP stack (a popular open source web platform) and VMware, including monitoring resources and services in Azure and Amazon Web Services. “These releases reflect our deep commitment to hybrid cloud. We strongly believe that the hybrid cloud is the reality for all enterprise customers, even those with the most ambitious cloud plans. Some applications should and will move quickly to public cloud, while others face technological and regulatory obstacles. Regardless of where these applications run today or will run in the future, Windows Server 2016 is the solution – providing both a rich and secure platform,” said Yong. 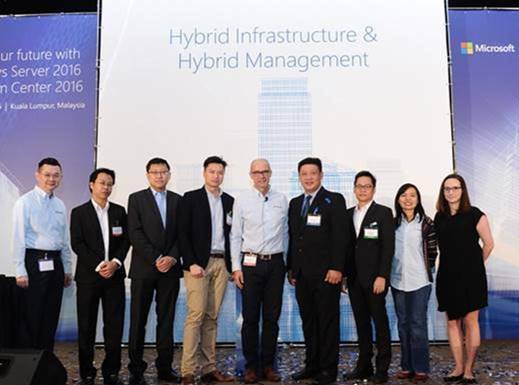 “We are committed to help customers in their cloud journey and the general availability of Windows Server 2016 in Malaysia marks another important milestone in delivering the most complete hybrid cloud solutions for customers of all sizes,” he added. Microsoft partners Citrix, Dell EMC, HPE, Intel, and Veeam were present at the launch event today and articulated why they had opted for Windows Server 2016 – in line with Microsoft’s continued commitment to security and hybrid platforms to meet modern IT needs.